Sometimes it feels to travelers that the wastes south of Nuria Natal will never end. But the sight of the distant MBazha mountains, once sand and storm clears, brings hope that their destination is near. The sands turn to barren wastes and those eventually become a sparse scrub-land. A dark line on the horizon, below the peaks, resolves into an escarpment rising several hundred feet in places. It runs from the Fassili mountains to the west to a point near Aerdvall in the east. Explorers, travelers and others fleeing the north, have reached the ridge and discovered that in some areas the cliffs are dotted with openings leading into hollows in the stone. Over the years, industrious souls have turned those caves into residences of varying sizes ranging from several caves supporting a single family to extensive diggings large enough to become a village. The number of inhabitants along the escarpment varies with the years, based on fate and fortune (in the form of raids, monsters, bad weather and other maladies). 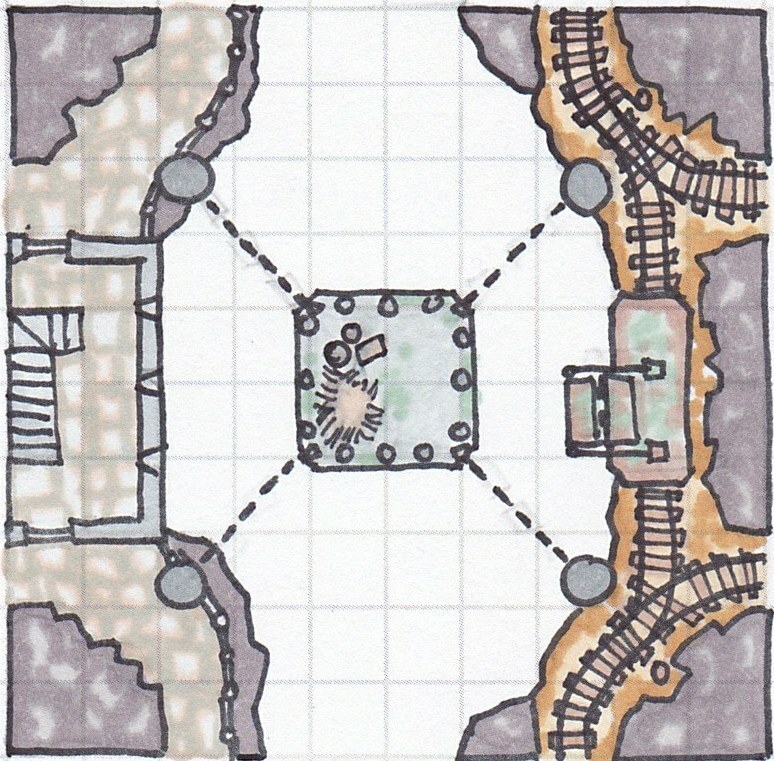 Desperate adventurers might be lucky enough to find an empty cavern complex where they can rest, heal and perhaps avoid pursuit. If unlucky, bandits or monsters may already claim the space. In the wastes south of Nuria Natal, a 1/2 mile long crevasse cuts across the flats. On the north side, reached by a dusty trail, a single building marks the entrance to the prison of A'Salm A'Zalam (the Silent Dark). In the depths of the chasm below the crevasse, whose bottom may be many hundreds of feet below the surface, cells are hung between the walls, rocking slightly in the stagnant, damp and cold air. Here the Nurians throw prisoners that will never be released. Escape is difficult if not impossible. Those who attempt such usually find themselves plummeting to the bottom of the chasm, mingling with rocks, debris and the bones of those who fell before them. The Cells shows a typical cell. On one side of the cavern arrowslits allow guards or a few visitors to view the imprisoned. On the other side a track guides a cart with a folding bridge, used for access to the cells. The Watch is a view above. 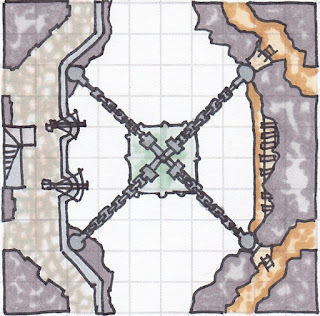 Above the arrow-slits are battlements with heavier weapons to use versus determined escapees. The Bottom is the depths of the chasm. Stone, bones, debris litter the floor. A narrow cold stream, which carved this rent in the earth eons ago, drifts silently in mute observance. 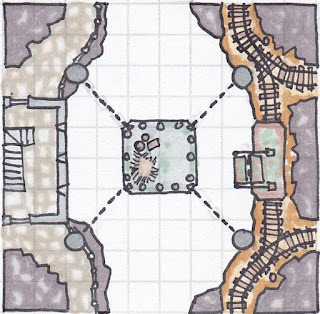 The fine folk over a Kobold Press are holding a contest - Lethal Lairs - to develop a 1500 word site/battle map for the #Southlands . Life being what it is these days, I didn't have time to complete my entry, but I did get far enough that I figure I'd post what I had. Likely I will also fold it into my current North Watch project. In the south and west of Nuria Natal, far from the rivers, the land turns to an expanse of barren waste. Bandits and raiders, who prey upon merchants on the roads and waterways, flee into the wastes to elude pursuit. Beyond the dry plains, the MBazha mountains fill the horizon. At the edge of those mountains, where water appears again, the robbers have built their homes into the rock. The largest settlement, home to the most dangerous band Rabban's Raiders, is a box canyon of stone soaked red by the blood of Titans spilled during a great battle in the ancient past. 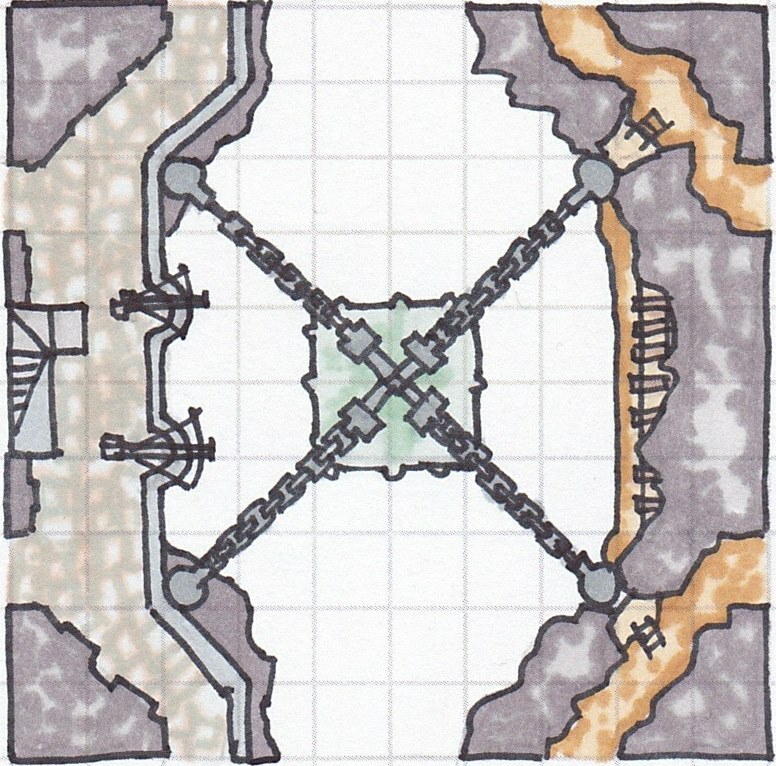 Rabban's Raiders hide in a narrow box canyon about 150 feet at its widest and well over 500 feet deep, The north end opens on to the Nurian wastes. Most of the natural foliage and cover has been retained or restored to hide the canyon from direct view. Only a narrow entry path can be seen on close or overhead inspection. The south end narrows to a steep path along a ravine ascending into the foothills of the mountains. It can be used for escape in times of danger, but the path is single-file and the climb tricky. The ravine becomes a dry wash that divides the canyon floor in half. The floor is filled with a variable number of tents (based on the strength of the Raiders at any one time). A large corral covers part of the west side. A number of rooms and chamber have been carved into or built out of the canyon walls. In the southwest corner is a three story group of chambers, known as Rabban’s Retreat, that is home to Rabban and his favored lieutenants. Guards patrol the space outside and the floors inside at all times. The canyon level floor of the Retreat features a small stables (1) for the steeds for Rabban and his lieutenants. Next to that is the entryway and hayloft (2), the latter connected by ladder to the 2nd floor. Beyond a doorway is the "mud" room where guests are greeted and some supplies are stored. Stairs (A) lead from the back of the mudroom up to the second floor. The stairs (A) from the ground floor lead to a hallway divided by several doors. Along the outside wall are two bedroom (4) for Rabban's favored lieutenants. Next is a lounge (5) that also features a small shrine maintained by Ibn-Mal the priest. At the end of the hall is a meeting room/kitchen (6) featuring a firepit, storage, a large table and chairs, Stairs (B) lead from the hallway outside (6) up to the third floor. 2 IF level guards are present at the end of the hallway (near stairs (B)) - 99% of the time. The stairs (B) from the 2nd floor lead to Rabban's quarters (7) that occupy the entire third floor. He has a large bedroom with a fine view of the canyon. Through a locked door is his office within which are two vaults built into the stone walls. Tall broad Natali man with dark skin, wide mustachios and bright teeth. Favors elaborate and rich clothing over heavy duty chain mail. Scarves and jewelry abound. Fights with all manner of swords, sometimes in pairs and sometimes with a shield. Possibly a disgraced noble of high stature. Short thin overly energetic Natali woman. Worshipper of the desert winds (or equivalent). Wears many scarves and ribbons. Favors whirling weapons like ships or chains (or kusari gama equivalent). Accomplished healed and provides mass blessings for the bandits (curses for their opponents). Skilled with herbs and cooking. Tall person of unknown race clad head to toe in brown and gray robes. Voice altered by magics. Wears a dull metal mask. Wields a simple staff of black wood and mithril heels. Has a small desert wyvern (or mini-drake) as a familiar. Summons the desert winds to shield large groups of bandits. Tall thin Narumbeki woman, perhaps ritually branded indicating her profession. Skill and savy hunter and thief. Good with bow, spear and long knives. Practiced outdoors and indoors. Very streetwise and knows many of the nobles (likely establishes bribes to select which caravans will not be subject to raids). The distribution of races of Rabban’s Raiders resemble that of the nearby nations, Narumbeki and Nuria Natal. However given the small total population, the proportions don’t follow the same percentages you might expect. The Lion Road stretches for many hundreds of miles from Nuria Natal south to Narumbeki. This series of articles considers the approximately three hundred mile stretch centered upon the keep at North Watch, the northern end of the Narumbeki gap. The lands to the south and east of the Lion Road feature a number of narrow valleys between the massive peaks of the MBazha mountains. Monstrous intruders have become more common in the shadows between the rises, thus the area has become known as the Greening Hills due to the rumored influence of the Green Walker of Kush further east. "Majesty surrounds us," T'Balla gestures in a wide circle, "The mighty peaks scratch the heavens themselves. And we live at their feet, in the narrow gaps between the giants. To the east, yea there are larger spaces, but they are cut off from the rest of the world. Mind you," he lowers his voice, "there are ways between the walls of stone to reach the spaces in between. But you may not like what you find." East of the Narumbeki Gap, the MBazha mountains, though not as high as their brethren to the west, are still mighty peaks. Their steep usually snow-covered slopes fill the area except for two notable valleys. The larger, east of the Lion Road, is known as the Vale of Ruins. The lesser, unknown to most except the rangers, a hunter or two and its inhabitants, is known as the Deep Green Valley. Both run north-south and are accessible by a small number of narrow mountain passes. Although ancient, the plateau is not natural but is in fact a section of the valley floor raised hundreds of feet into the air by the ancient Titans. The magicks lifted the surface from the bedrock, supported on miles-wide pillars of stone. The ritual left tall but narrow gaps and openings in the plateau leading into hollows underneath. Some lead to a variety of underground chambers, from others underground streams, fed by the mountains to the east, flow to the floor of the valley. A vast array of ruins, known as the Arena of the Titans, covers the top of the mesa. East of the Vale of Ruin, on the other side of another line of tall MBazha peaks, is a smaller, narrower and much more dangerous valley. Geographically similar to its brother to the west, this vale is narrower and filled with relatively dense foliage at the lowest elevations. Oriented roughly southwest to northeast, there are no known locations of note. Ruins of prior ages have disappeared into the greenery. The Deep Green hides a terrible secret for the pods and seeds of the Green Walker of Kush have recently taken root in the thick soil fed by snowmelt and mountains streams. An example of such an infestation is the Spawning Pool. A narrow defile on the east side of the valley hides a tower, the Keep of Vines, that is home to a minor Vine Lord, the Count of Thorns (Thalgorn the Shapeshifted). The weather mirrors that of the Narumbeki Gap. It is typical of alpine mountain ranges with short pleasant summers and harsh snowy winters. The locals are quite adept at predicting the potential for winter storms thus the few travellers, welcome or unwelcome, pay close attention to their words. Along the Lion Road, north of Narumbeki’s northern border, the locals generally follow the rules and traditions of their brethren to the south. The lands off of the Lion Road are sparsely populated, if at all. The residents follow their own traditions which are many and varied. Villages north of the MBazha mountains are usually home to wanderers and nomads from points north bringing with them the customs of Nuria Natal and elsewhere. Folk generally lead separate quiet lives. However, the locals will usually gather together to fend off any external threat. They would likely be lead by a notable local such as the Weatherman. "Might I suggest a large picnic basket of food? There are no Inns of note west of here. 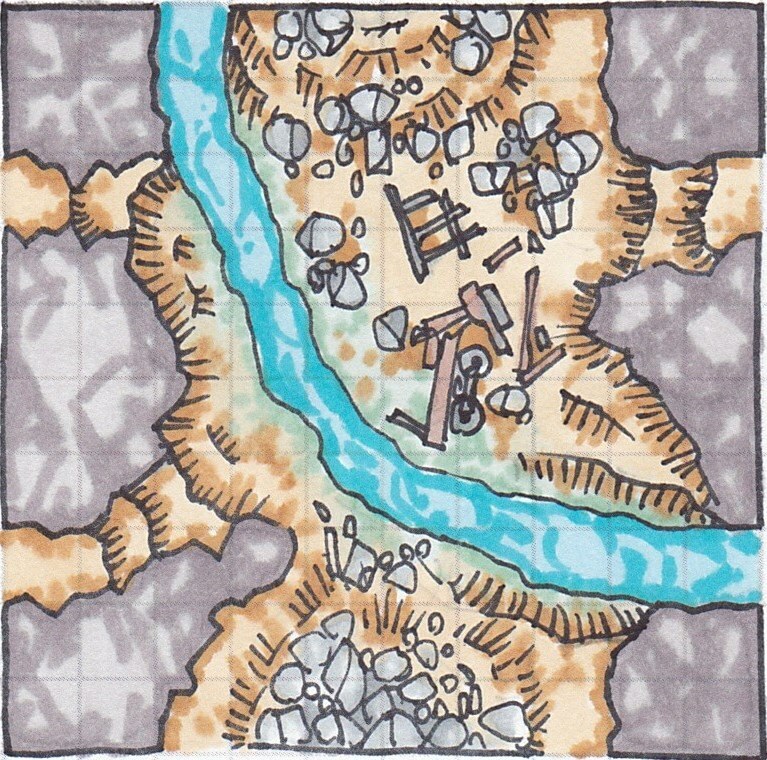 For that matter, no places of note but a rather unsavory settlement of ne'er-do-wells, a valley of ruins high in the air and a place where the wild animals are worse than usual from what the hunters say. Something is amiss there I do say." The following are locations of note in the eastern MBazha mountains between the Narumbeki border to the south and the foothills to the north. When the Lion Road was formalized by explorers from Nuria Natal, it originally continued directly south from the Lifts at the ridge. The route headed through a mountain pass into a wide mountain valley, skirted a large plateau that dominated the east and south sides of the valley, and continued southwest. The trail reached a wall of peaks of the MBazha range that could not be passed. One notable attempt was made to tunnel through the mountains. After that failed, the route was abandoned and became known by various names such as the Old Lion Road, the Lesser Lion or even the Toothless Lion. At the pass where the Old Lion Road threads the northern border of the MBazha mountains, roughly the equivalent location of North Watch in the Narumbeki gap 50 miles to the west, is a village nicknamed by the locals, Dead End. Dead End is not the first village to occupy roughly this spot in the pass and probably won’t be the last. 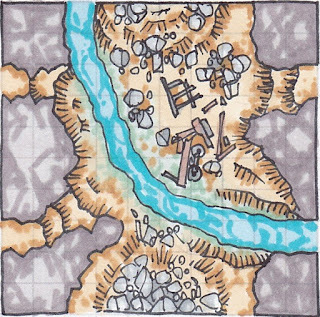 It serves as a gathering spot and trading post for the small population of locals, led by mayor Garrett Whitefeather, living in and about the narrow band of arable land north of the mountains and south of the wastes plus the few hunters and trappers of the peaks themselves. At least one caravan (that of Erim Rugika) makes regular stops at Dead End. South of Dead End is the mountain valley known as the Vale of Ruins. The eastern portion is dominated by the large plateau rising several hundred feet above the valley floor. From below, a traveler can just make out the tops of what appears to be a vast array of ruins covering the top of the mesa. The ruins are the remains of an ancient sporting complex and city known to scholars of antiquities as the Arena of the Titans. Thousands of years ago, the site hosted the Games of the Titans, where their humanoid minions engaged in annual contests of skill in an attempt to win the favor of their patron Lord. The titan Mwari, and his warrior minions who eventually became the Narumbeki legions, built the Arena and hosted the games. When the titans’ empire dissolved, the Arena was abandoned and fell to ruin. Now the streets are only filled with wind, snow and dust, but it is said, if one listens closely, the cheering crowds can be heard as well. The Arena was unusual as Mwari commanded that only the stadiums and game fields could see the skies. All other buildings and residences were built into the plateau underneath. Rumors suggest titan-forged relics may still be found in long forgotten vaults in the depths. Agents of the Count of Thorns, if they can evade the Rangers of the Vale, seek to explore the site. When the trailblazers laying the path of the Lion Road reached the end of the Vale of Ruins, they faced a tall impassable wall of peaks. Unable to find a pass, they decided, or perhaps were convinced (the reason is lost to time), to try to tunnel through the mountains. A camp was built at the base of the mountains and a goodly number of laborers and engineers brought into the wilderness. By all accounts the miners were making good progress until Midgard itself seemed to thumb its nose at the project. The MBazha mountains shrugged, rumbled and most of the tunnels collapsed killing many instantly. The survivors took this as a bad, tragic and expensive omen and the project was promptly abandoned. What remains is a fairly large entrance hall, a number of side chambers of various sizes and a main highway that goes about 1/2 a mile into the rock and ends at a massive deadfall. Outside very little remains of the encampment, only the weathered remains of the ornately carved entrance mark the end of the Old Lion Road. Just inside the recently arrived dwarf, Thramron Coldman, has taken up residence. Along the eastern edge of the Deep Green Valley, shielded from view by barriers both natural and magical, is the residence of the Walker’s agent in the area, the Count of Thorns (Thalgorn the Shapeshifted), known to its inhabitants as the Keep of Vines. Reached by a narrow path leading down a rocky defile, from a distance the Keep appears to resemble a large stone tower, outbuildings at its base, covered in foliage. Closer inspection reveals that the thick thorny vines are the mortar of the tower, holding all manner and size of stones into place as the walls and floors. The foliage also serves to support the wood, shingle and stone comprising the roofs. East of South Watch, near the northeasternmost point of the Narumbeki border, lies the lodge of the Narumbeki rangers, known as the Wooden Shields. 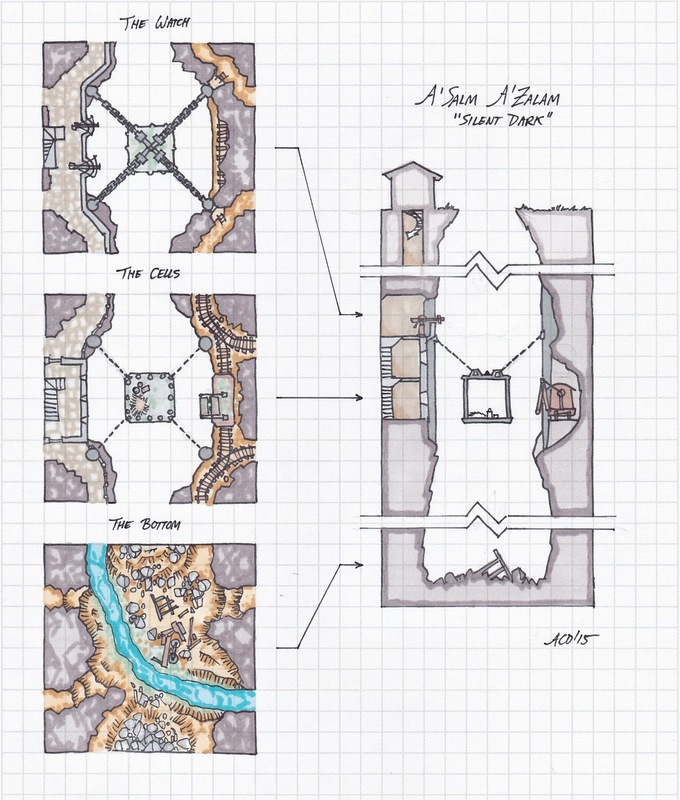 The lodge, now a walled encampment of a fair size, hosts at least a company of rangers, scouts and warriors, led by their Elven captain, Qinfar. Their mission is to prevent the infiltration of the meadows south of the MBazha mountains by pods, seeds and tendrils of the Green Walker. The bulk of the Rangers patrol the lands from just east of the Lion Road to the eastern border of Narumbeki. 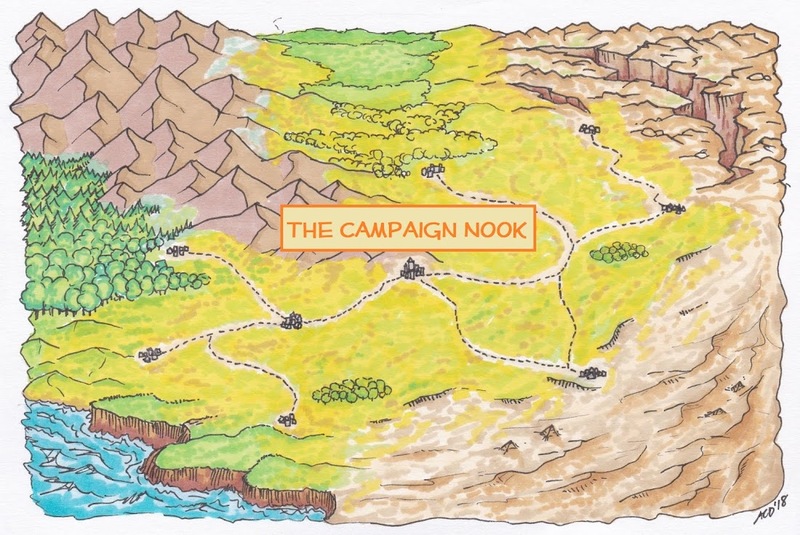 Fearing the Walker’s influence may be spreading further north, a smaller number of Shields undertake lengthy missions into the mountains, as far north as Dead End, but usually are encountered in the Vale of Ruins and the Deep Green Valley, should one dare to traverse the latter. In the Southlands north of the MBazha mountains between the Lion Road and the Old Lion Road, a druid has grown a home in the foothills where the peaks descend toward the plains and wastes that lead north to Nuria Natal. Simply known as the Weatherman, the druid's home is nestled against a large tree that grows about the circular structure. The tree sits on a earthen outcropping. A spring flows from between its roots into a small pool leading to a creek flowing further downhill. The druid vigorously protects the area, usually by using wind, snow and rain to confuse, drench or bury unwanted intruders. The locals note the druid is especially harsh to any thing or persons coming from the southeast (the direction of Kush).﻿ The druid is known to meet with the rangers of the Wooden Shield to exchange intelligence regarding activities of the Green in the mountains to the south and east. The Green Walker, and its minions, constantly strive to grow their command of the land beyond the borders of the Yawchaka Jungle. On the western edge their advance is stemmed by the fires and magicks of the Narumbeki Legions. To the north and south the situation is more fluid. Creatures and humanoids, controlled by the Walker, are dispatched into the MBazha mountains carrying seedlings, cuttings and pods of the corrupted flora of Kush. Where the Rangers or the Weatherman are not present, the land itself, aware of the violations travelling across the surface, resists as well. Weather, predator or the landscape intercept and kill the couriers, their packages left to dry and rot. But sometimes the Walker succeeds. In the Deep Green Valley of the MBazha mountains, minions fall into mountain pools and are swiftly consumed by their deadly cargo. The mutated flora fills the pool and grows beyond, forming a writhing hedgerow about the living-giving waters. Branches and leaves intertwine to form a dam, like such made by beavers, to capture the streams, especially when turgid with snowmelt, and hold the waters through the drier parts of the year. The plants themselves are relatively defenseless. But unwary animals, who might drink of the downstream runoff, could be pricked by the hedgerows vines or even consume the bright flowers, are turned into warriors for the Green cause. Giant elk or fierce badger froth at the mouth at the chance to defend the Spawning Pool. Their dead foes are pitched into the depths to feed the rotten core at the bottom. T'Balla kicks a rock with his foot, noting the way it bounces across the ground, "Each hop and skip leads to a different path eh? Years ago, if the gods of the mountains had not shrugged in indifference, the Lion Road would have taken a different path and either this place would elsewhere or would have been built here but been a shade of its potential self. We are fortunate they did what they did and the road came this way eh?" Approximately 3000 years ago - Warrior tribes, once beloved of the Titan Mwari, settle on the plains south of the MBaka mountains. 100 years ago - a Vine Lord, first of several, sneaks into the Deep Green Valley and builds the Keep of Thorns. Narumbeki Rangers of the Wooden Shield patrol the southern board of the MBazha mountains between the Lion Road and the roughly north-eastern corner of Narumbeki lands, north of the Burning Fields. They suspect that the Green Walker has agents in the eastern valleys but have yet to have the strength or perhaps stamina to mount an expedition to raze the area. "You wish to be alone?" T'Balla replies to his mysterious visitor, "Then the lands about the gap are certainly for you! The Lion Road itself is home to few. The mountains home to fewer still. Dare say the Trolls and Giants likely outnumber the people once you leave sight of the road. But don't assume every green meadow is a welcome patch of grass ... Some, it is said, will consume you if you lay down to rest even for a moment." Erim Rugika is a human caravan master [LN, IF level, merchant] who makes regular trips to Dead End from points north and south. Erim used to be a mercenary and after one too many risks he lost a leg. One of his friends suggested he take his remaining extra pay and set himself up a shop of general goods. The idea was great but the location was poorly chosen. So after a couple of years he heard from an old friend who lived in Dead End. Dead End, he was told, is a quiet place with no questions asked; but there was a poor selection of goods. Erim jumped at the chance and has become an excellent trader. Thalgorn the Shapeshifted was a dwarf jeweler who hailed from Sebbek Sobor. He was blessed with an unnatural way with stone. Once on a trip to Lignas’ famed Scroll Market he made a deal with a human for a scroll that promised a unique way of listening to stone to hear what gems were inside. As soon as money and scroll were exchanged the human beat a hasty retreat. Inside the scroll was a map to a spot in the Deep Green Valley. Deciding to take his chances that the new ability to listen to stone might be found in wilds he quickly traveled there. But as he approached the location a curious cloud of spores engulfed him and that was the end of Thalgorn and the birth of the current self-titled Count of Thorns [CN, Villain level fighter]. His short and burly form now resembles a mass of rock held together by vines with sharp thorns. The Count is a minor Vine Lord of the Green Walker. When not brooding in his Keep of Vines, Thalgorn lumbers through the woods of the Deep Green Valley seeking to bring new recruits to his master and perhaps, someday, a hero who will end his misery. The leader of the Wooden Shields is an Elf Ranger named, Qinfar [CG, Hero level ranger]. Qinfar lived in the jungles of Kush most of his life. His aunt taught him skill with a bow and an elder druid taught him how to work with the jungle and the animals therein. When the Walker was summoned, Qinfar and his kin fled in horror to Narumbeki. Seeking to prevent a repeat of Kush, in an unusual move for an Elf, Qinfar joined the Wooden Shields. He quickly rose through the ranks due to his prowess with the bow and his preternatural abilities with nature. Now as he leads the Wooden Shields in these troubling times, he instructs others how to work with nature and strives to have everyone live in peace and harmony. Garrett Whitefeather is the Heru mayor of Dead End [N, OF level, expert]. He got the job because no one else was interested in it. Garrett has a mate, Sara and a nestling Carrie, 6. Garrett is a jack-of-all-trades and manages to successfully run the town, simply because he doesn’t ask too many questions. When fights break out or other problems occur he simply puts the offenders in jail cells facing each other. Garrett won’t allow the miscreants to leave until they settle their differences and are willing to shake hands. This seems to work most of the time. On the rare occasion it doesn’t he threatens to call on his friends Qinfar (to send a Shield of Rangers) or the Weatherman (to turn the combatants into newts) to take care of the problem. Case closed. The Weatherman is a shape-shifting Human Druid [LN, Hero level druid] who protects the people of the hills north of the Gap by communing with the nature and animals of the Gap. His real name is Rawlings Steelson. Rawlings can change into a bear, wolf and his personal favorite, an eagle. Rawlings works with Qinfar to prevent the influence of the Green Walker from growing in the Gap. Rawlings is lifemated to Qinfar’s sister, Anna [NG, IF level cleric]. The couple lives in the northern hills at the build simply called Home . East of the Lion Road and south of the wastes. Roll an encounter roll for each 4 hours of day or 10 miles of travel. Avalanches, snow squalls and other harsh winter weather are common in the MBazha mountains, especially in winter. 1-75 A Shield (6 OF level fighters) lead by a Ntanga (Lieutenant, OF level fighter) on a walk-about patrol from the nearest village (if in 10 miles of the Lion Road). T'Balla squints at the young warrior in her new leather armor and newly sharpened spear, "So you chose the way of the sword did you? Well, likely a strong arm can find work with the caravans, especially those who go off the beaten path. You may consider service with the Rangers in the south or something less savory with those who migrated to the Dead End of a lesser road." [OF] Abduhl of the Arrantir family of caravan masters would have a cousin, Sarim, to learn his trade. He has set up Sarim with a small caravan to travel from North Watch to Dead End and back. Abduhl is hiring guards to accompany young Sarim. Aside from the dangers of the journey and the unpredictable residents of Dead End, there is a competitor (Erim Rugika) who would like to see Arrantir fail. [IF] The druid known as the Weatherman has vanished when hunting along the MBazha mountains. The Rangers of the Wooden Shield seek help in finding him before the blizzards of winter blow across the region..
[H] Scrolls, uncovered by Thorne Redwood, suggest there may be items of unusual nature in vaults lots during the collapse of the Tunnel of Folly. Redwood is organizing an expedition to the Vale of Ruins. [EH] Captain Qinfar of the Wooden Shields seeks all who are worthy to join an expedition to rid the Deeper Green Valley of the Count of Thorns. [EH] Thalgorn the Shapeshifted seeks an end to his tortured existence. To do so, the Rangers learn, may cost the lives of all in Dead End.